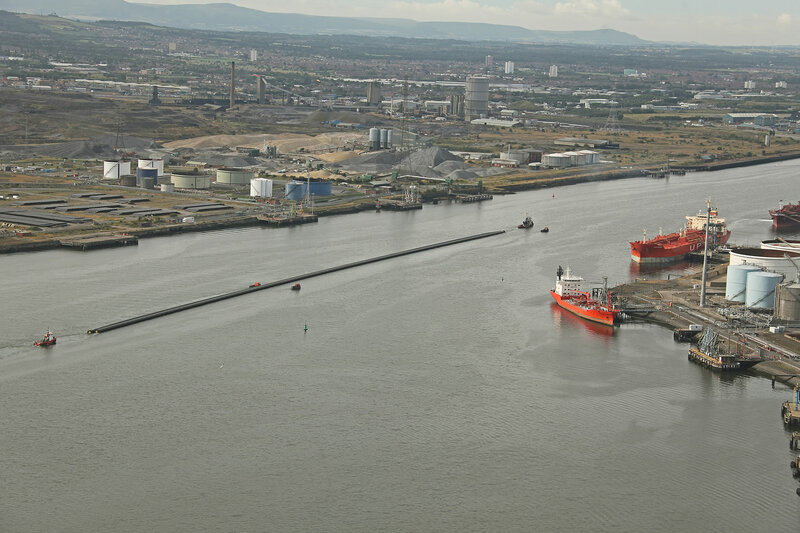 Being commissioned by Arup, acting for Yorkshire Water, to shoot aerial still images and gyro stabilised video, of an ocean going tug, towing a half kilometre long pipeline from Scandinavia into the river Tees, it appeared a challenging task, due to tidal and weather limitations. Having worked the area for a good many years it was apparent that certain legal considerations needed to be met. Working closely with Capt. Scott Myers at Heli-Jet we obtained permission to fly within the restricted Danger Area which is a 2 mile radius exclusion zone of Hartlepool Power Station, which extends into our proposed flight area. Without this permission we would have been refused permission to operate. To obtain this exemption the helicopter must operate under an AOC (air operators certificate) as Heli-Jet does. Other permissions were required as the area contains heavy industry working in the chemical fields; these were obtained and adhered to. The exact arrival time of the tug was uncertain but within a high-tide envelope, liaising with the tug master via comms in the heli we were able to be over target at exactly the right time. Using an UltraMedia 2, 5 axis gyro stabilised camera fitted to a Jet Ranger helicopter we were able to record perfect video shots. At the same time using Canon stabilised stills cameras we obtained excellent still images. They were transmitted to the client for web use the same day. By planning every detail in advance Peter Smith Photography and Heli-Jet Aviation were able to fulfil a difficult brief, working in a very demanding environment, on time and within budget.